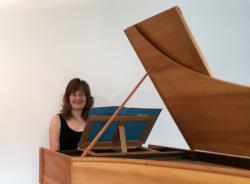 Sylvia Ellison brings her harpsichord to the Oxmarket, briefly compares its characteristics with the resident 1910 Bechstein piano, and performs works by Scarlatti and J.S. Bach. All taking place within the exhibition in the Oxmarket Gallery of prints by Daphne Casdagli and paintings by Catherine Barnes.